>I am a big proponent of doing gauge swatches for knitting and crochet projects. I know sometimes that’s not what people want to hear, but when it’s a question of getting the right size or something that’s too large or, worse, too small, gauge swatches are extremely important. But, what happens when you’re going out of town, and you pack a project that you want to start, but you only pack one needle or hook? You wing it! That’s what I did when I went to DisneyWorld this past weekend with my son and his friend. I took a crochet project, the crocheted Maid Marian hat by Grace Akhrem. I want to make this as a Chemo Hat (check out my previous blog post on that), so I chose a worsted weight yarn that had no wool or other scratchy fibers in it – Classic Elite’s Classic Silk. It’s a lovely yarn, and it would be perfect for a chemo hat. I took the hook size recommended in the pattern – a #7 (4.5mm) which is between a G and an H hook. And, away I went. Well, I knew pretty soon that my gauge must be off. You start this hat by doing to the bottom portion from side to side. The pattern said I should complete 32 repeats of the 2 rows that make up the stitch pattern. I stopped at 28 repeats, because that’s what fit around my head (and I have a big head). So I went ahead & started the top part of the hat, making a few adjustments to the pattern to accommodate the fewer repeats. After the first decrease round for the top, I decided to try it on: I have several rounds to go before the end of the hat – and I already look like a cone-head! I can only image what the hat would have looked like if I had done 32 repeats! So what does it all mean? I’m back to the drawing board. I’ve decided that the yarn probably would be too thick and stiff if I went down one or two hook sizes; so I’ve abandoned the Classic Silk. (Don’t worry, it will get used for something else!) Next, I’m going to try a lighter weight yarn – a DK weight instead of the called for worsted weight. I’ll try it with the same hook size. And, guess what? I plan on doing a gauge swatch first! Lesson learned! For the umpteenth time! 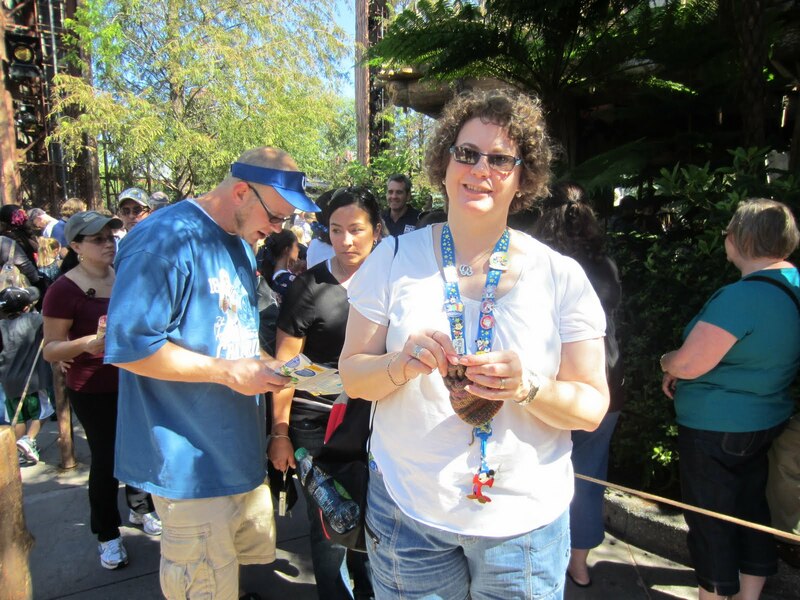 And, just in case you didn’t see this on FB, here’s a photo of me knitting in line at DisneyWorld. Aren’t we knitters and crocheters lucky that we have something to occupy us while we have to wait? >On the 1st & 3rd Tuesdays of each month, I host “Out to Knit” at Mendoberri from 11:30am-1:30pm. Anyone can come – so please join us! Plus, Mendoberri offers us a 10% discount on our food for “Out to Knit.” Sweet, huh? The Out to Knit group recently decided to do a Knit-A-Long (KAL) as a group. 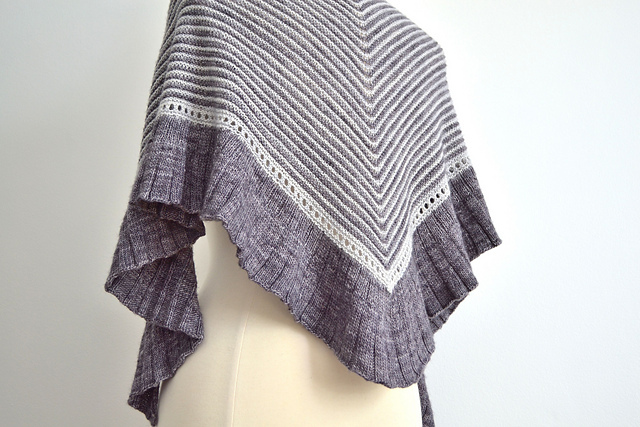 Because it’s hard to decide on a specific pattern – particularly because we are actually a group of knitters and crocheters, we’ve made it fairly generic by just saying that everyone is going to be making a shawl. I have chosen and started my shawl: Sothia by Robin Ulrich. This is not a pattern that we carry in the store – although I will be looking into the possibility of that. But I couldn’t resist it. I’m not sure what everyone else is making yet, but I will take my camera to next week’s Out to Knit so I can make sure and show off our work! >Several years ago a group of women from the Woman’s Club of Minneapolis, many of them cancer survivors, started knitting chemo caps for patients at the Hennepin County Medical Center (HCMC). Two years ago, they donated over 300 hats. By donation time in April, HCMC had just one hat left. Last year over 400 hats were donated! HCMC was happy about the increased donation, because in addition to chemo patients, they would like to make sure that any child that visits the hospital during the winter is given a hat if he/she doesn’t have one. In order to accommodate these needs, more people are needed to participate. 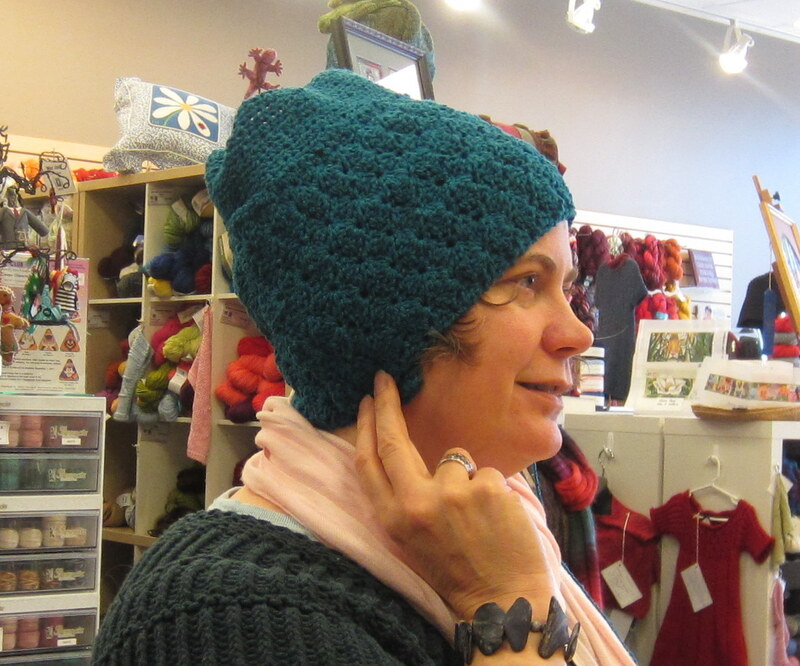 Hats don’t require a lot of yardage, so many avid knitters and crocheters may have leftovers from projects that can be used to knit a hat or two. 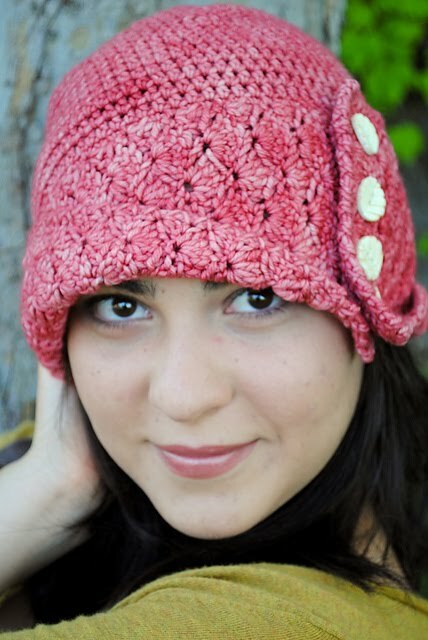 The only issue in regard to the chemo hats is that they need to be made with soft yarns that won’t itch. When people lose their hair, the scalp is extremely sensitive. We recommend using cotton or microfiber yarns. The Grace Akhrem patterns pictured in this post would make great chemo caps. They will be available at the store within the next couple of weeks. 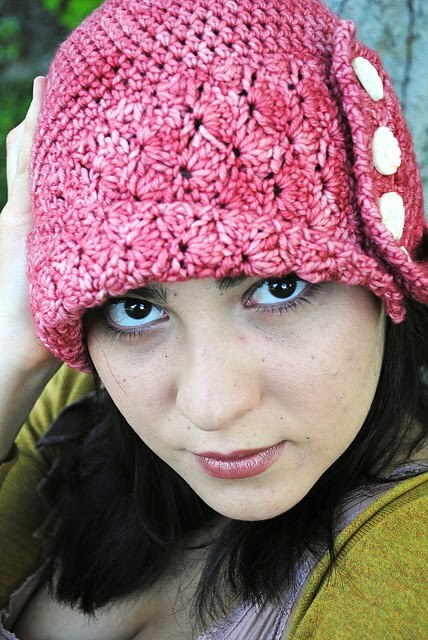 In the meantime, if you are antsy to get started, Head Huggers, has a number of free patterns for hats that would be suitable for chemo patients. Feel free to drop off your completed hats at the store. Label them HCMC, and Alison will deliver them to the Woman’s Club of Minneapolis. >Yesterday, Claudia Speak, who works in the NICU at Children’s Hospital in St. Paul, came into the store and talked with me about the preemie hats that they receive from knitters and crocheters. They love the fact that people are making the hats for the babies! Claudia said that the look on the mother’s faces when they see their little ones wearing one of the handmade hats is priceless! Unfortunately, they’ve had some issues with the knitted hats, in particular, not fitting properly. Often if the hat is made with a ribbed brim, the cast on for the brim is too tight. Here is a photo of one that the nurse had to cut at the cast on in four places in order for the hat to be used. In addition, some of the hats are a little too short for a preemie. 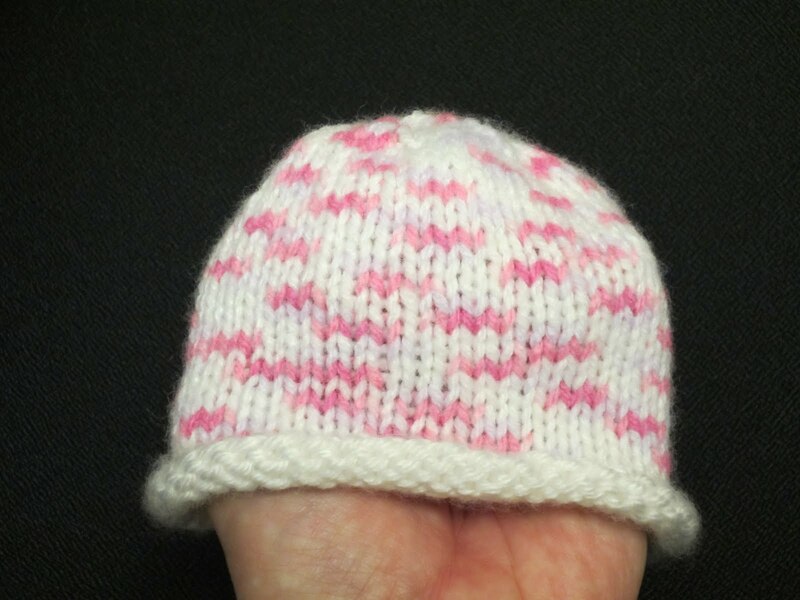 So, Claudia has come up with a basic template to use for knitted preemie caps. She has used a rolled brim for her cap (if you want to use a ribbed brim, try using a cable cast on, which is much more elastic than the more typical long-tail cast on). Here is a photo of a finished preemie cap using Claudia’s template. 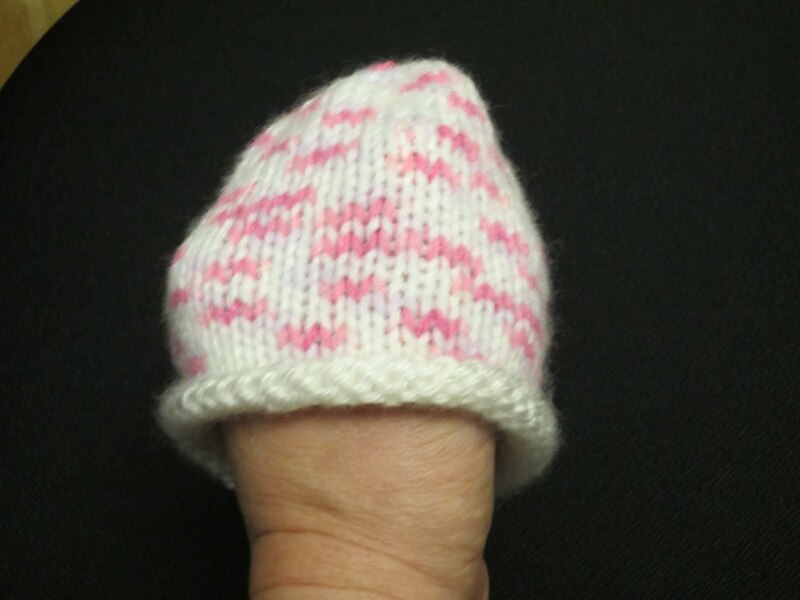 Hope this helps all of you who are interested in knitting preemie hats. I’ll try to come up with a similar template for crochet preemie hats soon. If you have preemie hats you would like to donate to Children’s Hospital in St. Paul, feel free to drop them off at the store. I will make sure that Claudia gets them!